This article is about a group of birds. For the waterproof hip boots or fishing trousers, see Waders (footwear). There are about 210 species of wader, most of which live in wetland or coastal environments. Many species of Arctic and temperate regions are strongly migratory, but tropical birds are often resident, or move only in response to rainfall patterns. Some of the Arctic species, such as the little stint, are amongst the longest distance migrants, spending the non-breeding season in the southern hemisphere. Many of the smaller species found in coastal habitats, particularly but not exclusively the calidrids, are often named as "sandpipers", but this term does not have a strict meaning, since the upland sandpiper is a grassland species. The smallest member of this group is the least sandpiper, small adults of which can weigh as little as 15.5 grams and measure just over 13 cm (5.1 in). The largest species is believed to be the Far Eastern curlew, at about 63 cm (25 in) and 860 grams (1.90 pounds), although the beach thick-knee is the heaviest at about 1 kg (2.2 lb). In keeping more in line with the traditional grouping, the Thinocori could be included in the Scolopaci, and the Chionidi in the Charadrii. However, the increasing knowledge about the early evolutionary history of modern birds suggests that the assumption of Paton et al. (2003) and Thomas et al. (2004b) of 4 distinct "wader" lineages (= suborders) already being present around the Cretaceous–Paleogene boundary is correct. Shorebirds is a blanket term used to refer to multiple species of birds that live in wet, coastal environments. Because most these species spend much of their time near bodies of water, many have long legs suitable for wading (hence the name ‘Waders’). Some species prefer locations with rocks or mud. 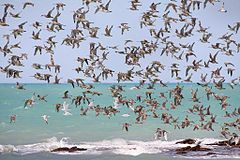 Many shorebirds display migratory patterns and often migrate before breeding season. These behaviors explain the long wing lengths observed in species, and can also account for the efficient metabolisms that give the birds energy during long migrations. The majority of species eat small invertebrates picked out of mud or exposed soil. Different lengths of bills enable different species to feed in the same habitat, particularly on the coast, without direct competition for food. Many waders have sensitive nerve endings at the end of their bills which enable them to detect prey items hidden in mud or soft soil. Some larger species, particularly those adapted to drier habitats will take larger prey including insects and small reptiles. Shorebirds, like many other animals, exhibit phenotypic differences between males and females, also known as sexual dimorphism. In shorebirds, various sexual dimorphisms are seen, including, but not limited to, size (e.g. body size, bill size), color, and agility. In polygynous species, where one male individual mates with multiple female partners over his lifetime, dimorphisms tend to be more diverse. In monogamous species, where male individuals mate with a single female partner, males typically do not have distinctive dimorphic characteristics such as colored feathers, but they still tend to be larger in size compared to females. The suborder of Charadrii displays the widest range of sexual dimorphisms seen in the Charadriiformes order. However, cases of sexual monomorphism, where there are no distinguishing physical features besides external genitalia, are also seen in this order. One of the biggest factors that leads to the development of sexual dimorphism in shorebirds is sexual selection. Males with ideal characteristics favored by females are more likely to reproduce and pass on their genetic information to their offspring better than the males who lack such characteristics. Mentioned earlier, male shorebirds are typically larger in size compared to their female counterparts. Competition between males tends to lead to sexual selection toward larger males and as a result, an increase in dimorphism. Bigger males tend to have greater access (and appeal) to female mates because their larger size aids them in defeating other competitors. Likewise, if the species exhibits gender role reversal (where males take on roles traditionally done by females such as childcare and feeding), then males will select female mates based on traits that are the most appealing. In the Jacana species, females compete with each other for access to male mates, so females are larger in size. Males choose female mates based on who presents herself as the strongest and who 'owns' the most territory. Another factor that leads to the development of dimorphisms in species is natural selection. Natural selection focuses on traits and the environment's response to the traits in question; if the said trait increases the overall fitness of the individual possessing it, then it will be 'selected' and eventually become a permanent part of the population's gene pool. For example, depending on the food available in a shorebird specie's respective niche, bigger bill sizes may be favored in all individuals. This would essentially lead to monomorphism within the species but is subject to change once sexual selection acts on the trait. Sexual selection could give rise to males with relatively larger bills than females if males used their bills to compete with other males. If larger bill size assisted the male in gathering resources, it would also make him more attractive to female mates. ^ G.C. Boere, C.A. Galbraith and D.A. Stroud (2006). "Waterbirds around the world" (PDF). Joint Nature Conservation Committee. ^ a b c "Explore the World With Shorebirds." U.S. Fish and Wildlife Service, 1 Aug. 2004. Web.<http://www.fws.gov/alaska/external/education/pdf/Chap4.pdf>. ^ a b Lindenfors, P., T. Szekely, and J. D. Reynolds. "Directional Changes in Sexual Size Dimorphism in Shorebirds, Gulls and Alcids." Journal of Evolutionary Biology J. Evolution Biol: 930-38. Print. ^ a b c Szekely, T., R. P. Freckleton, and J. D. Reynolds. "Sexual Selection Explains Rensch's Rule of Size Dimorphism in Shorebirds." Proceedings of the National Academy of Sciences (2004): 12224-2227. Print. Lindenfors, P.; Szekely, T.; and Reynolds, J. D. (2003). Directional Changes in Sexual Size Dimorphism in Shorebirds, Gulls and Alcids. Journal of Evolutionary Biology J Evolution Biol: 930-38. Print. Szekely, T.; Freckleton, R.; & Reynolds, J. (2004). Sexual selection explains Rensch's rule of size dimorphism in shorebirds. Proceedings of the National Academy of Sciences. 101(33): 12224-12227. Szekely, Tamas; John D. Reynolds; and Jordi Figuerola. (2000) Sexual Size Dimorphism in Shorebirds, Gulls, and Alcids: The Influence of Sexual and Natural Selection. Evolution 54(4): 1404-413. This page was last edited on 22 February 2019, at 20:10 (UTC).